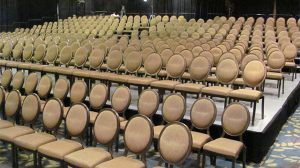 Seating risers rentals can be divided roughly into two different types - seating for professionals such as choir members, the press or VIP’s and secondly, seating for regular audience members. Each type has specific limitations and requirements and the staff at In Depth Events is experienced in both types. From concept to completion, we’re here to provide the right solution for your seating riser rental needs! Ask Us a Question! Audience Seating Risers rentals for audience members is one of the things we do best. Our custom audience risers are made with Bil-Jax staging, which allows us incredible flexibility on elevations and riser sizes. We also utilize pre-engineered riser systems for our clients for large seating installations. Both of these systems are scalable, allowing for hundreds or thousands of attendees. We offer solutions for tip and roll bleachers, as well as providing a better audience experience with covered grandstand seating. Any of our seating options for audience members can be utilized in indoor or outdoor environments. One of the most important aspects in building risers for professionals, as well as audiences, is safety. The staff at In Depth Events consistently meets or exceeds ADA requirements on our risers, handrails, ADA ramps and our step units. We’ve built thousands of choral and choir risers, with and without orchestral thrusts, in indoor and outdoor locations and with and without seating. You won’t find a company with more experience than the staff of In Depth Events. Some of our best clients are photographers with annual photo shoots. Whether it’s a corporate group, a commencement or a high school sports team, our photo seating risers rentals are second to none. 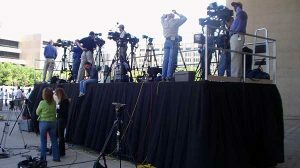 In addition, our press risers and observation platforms are stable structures that make sure press and PR people are well cared for at your event. CAD Drawings and Engineer Certified Drawings – What’s the Difference? Simple! Any reputable rental company will be happy to provide a CAD drawing for seating structures as part of the quote process. These are built by a designer who knows the sizes and application use of staging and seating riser rentals systems. However, an Engineer Certified Drawing means that a certified engineer has reviewed the drawings and literally stamped the drawings to indicate they are safe to use. At In Depth Events, our experts are experienced in riser systems, working with engineers to provide documents and working with municipalities and Fire Marshals to make sure your risers are safe. Ask Us a Question to find out how we can help you with your audience seating needs!